With a Sanyo wine cooler, you can experience quality and style. The Japanese Sanyo’s highest priority lies in customer satisfaction and harmonization with environment, which goes perfectly with its quality products. Over the years, their products have grown indispensable in the lives of people all over the world. The follwoing review describes the main features and benefits of Sanyo wine cooler models. Find out about the most distinctive features and benefits of Sanyo Wine Refrigerators. This Sanyo wine refrigerator has the capacity to hold up to 24 bottles and has 4 slide-out shelves. Features of this Sanyo model resembles that of the BC-1206, however, it wears an elegant look with smooth back design and eclipse series black interior. The SR-3500 model highlighting titanium trim is a stylish cooler simply great for accommodating 35 bottles. Attached with a double pane tempered glass door for maximum thermal insulation, the cooler looks great with an attractive metallic-looking trim. 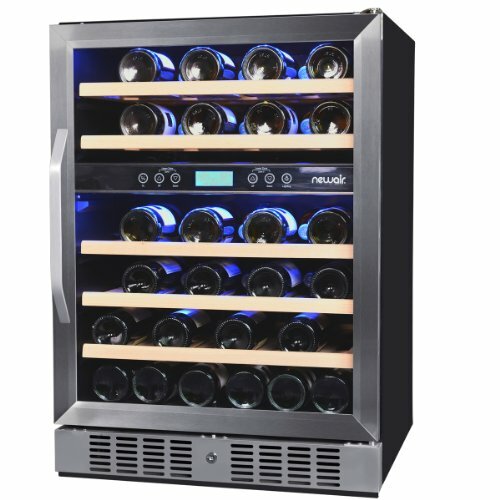 The adjustable thermostat ensures red or white wine is chilled to suitable temperature. Interior of the wine cooler features a stylish black finish. SR-3500 is available both as freestanding as well as under-counter requiring 1 inch of clearance on each side. The smooth back design makes the cooler easy to place anywhere and the two leveling legs add to the stability of the unit. There are no chances of overflow as the built-in countertop is designed to hold a 12-ounce liquid spill, which doubles as a decorative or serving station. Incorporating six chrome-cradle slide-out shelves, the model allows you easy access and selecting of wines.These shelves are specifically angled to keep the corks moist. Additionally, this is an energy-efficient unit. Price: cc. US$250 (US$7.14 per bottle). The Haier Aficionado 37-bottle wine cooler is a good alternative in this capacity range. A similar wine storage unit is the Dual Zone Amcor WV-50 wine refrigerator with 35 bottle capapcity. 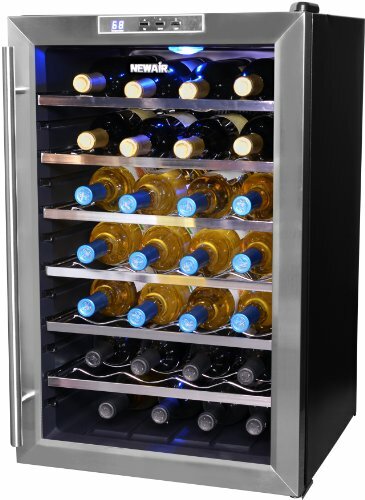 Featuring a stainless steel door frame and handle, the SR-4705 model is your need, if you are seeking a sturdy and capacious single zone wine cooler. This voluminous unit has space for 47 bottles and features tempered glass door with double-panes accompanied by a well-designed metallic-looking trim. Whether it’s red or white wine the adjustable mechainical thermostat keeps your wine chilled at constant temperature. The unit can be placed under the counter or as freestanding according to your convenience. Use the two leveling legs to adjust the position. With 6 chrome cradle slide-out shelves the cooler offers the convenience of viewing and selection of wine. The smooth back enables you to position the unit at a decent place. Further, this unit also offers a built-in countertop, which can hold 12-ounce liquid preventing overflow. The annual energy consumption of the SR-4705 is around 390 kWh. Price range: cc. US$380 – 500 (US$8.08 – 10.64 per bottle). Similar Products:The Avanti 46-bottle wine refrigerator, Model WCR5104DZD and the Summit SWC530LBI wine cooler offer similar storage capacity in 2 temp. 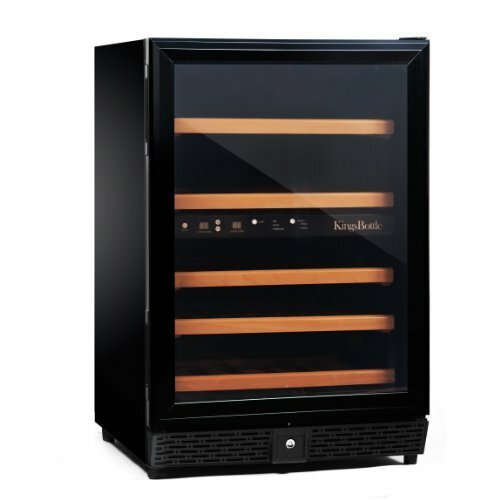 zones.The Magic Chef MCWC44DZ wine cooler is a cheap two-zone unit with 44 bottles capacity. 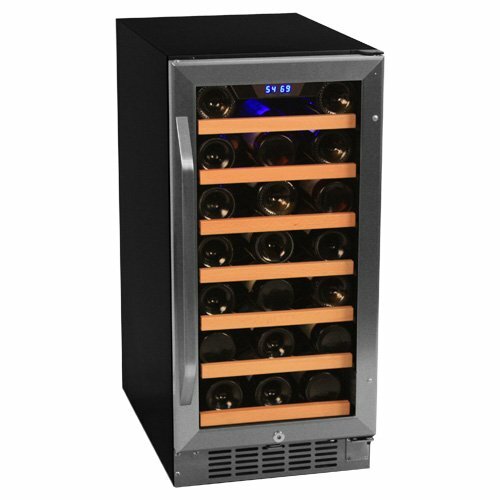 It is a perfect cooler for you if you are looking for a 24-bottle wine cooler with terrific features. It has the capacity to hold a Half-Barrel Keg. This attractive cooler presents a dual pane and tempered glass front door for effciient thermal insulation. Complementing the elegant facade, the cooler offers black door trim and black interior, perfect to fit any décor. 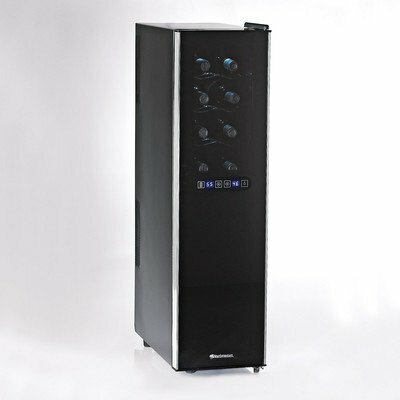 With an adjustable thermostat control, this Sanyo wine refrigerator is perfect for white as well as red wines. It has sophisticated pressure regulator and pressure gauge. The unit also features a complete CO2 Tap System with cleaning kit. Further, the smooth back design and black cabinet lends an appealing look to the room. For your convenience, the cooler features four contoured, pull-out shelves that make it easier for you to choose bottles. Price: US$ 560 (US$ 23.33 per bottle). Cheap Wine Coolers – reviews of some discount wine refrigerators.